Calling all valley’s arts and craftspeople - book your Hebden Bridge Open Studios spots now! Artists and craftspeople who want to be part of this year’s Hebden Bridge Open Studios event need to submit their entry forms by the closing date for applications, February 23. .
Planning is already underway for the popular event, which will take place on July 6, 7 and 8, 2018. Once again the whole weekend will dedicated to showcasing the wealth of talent in the vibrant creative community in the upper Calder Valley. Last year 90 artists welcomed visitors into their studios and workshops, which provides an opportunity to see their work - and also at work. The Open Studios map is centered in Hebden Bridge and also extends to Todmorden, Heptonstall, Old Town, Mytholmroyd and Luddenden. 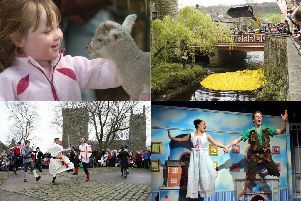 A spokesperson said: “Artists and craftspeople from the town and surrounding upper Calder Valley are invited to take part in this regular fixture on the Hebden Bridge cultural calendar. “The Hebden Bridge Open Studios steering group is keen for even more artists to take part this year. The spokesperson added that: “Visitors should look out for details of the weekend when the Hebden Bridge Open Studios brochure is launched in May. “This will contain the details of all of the artists who are taking part and where to locate them.